This KnowledgeBase document is intended to provide a high-level overview of how to create and submit an HR Transaction. Category: University Staff Ongoing (CP), University Staff Project (CJ), and University Staff Temporary Employees (TE). Audience: Department and Division staff who create JEMS CHRIS-HR transactions. Overarching Process: High-level overview of how to create a JEMS CHRIS-HR transaction. 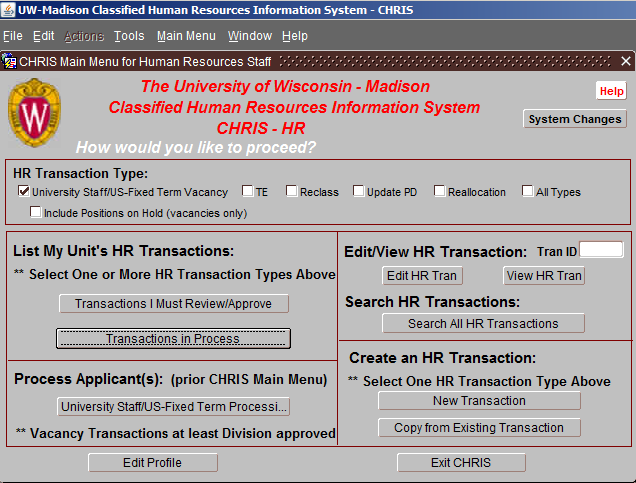 If creating a new HR Transaction, go to the JEMS CHRIS-HR main menu. Check the box next to the type of HR Transaction to Create (University Staff/Fixed-Term Vacancy, TE, Update, or Reclass) and then press the ‘New Transaction’ button in the Create an HR Transaction section of the main menu. The Update and Reclass PDs all require an employee id/employee record number for which the HR Transaction will be created. Note: If an HR Transaction already exists for the entered appointment, the system will copy the latest approved PD to be used as a template for the new PD requested. 4 Complete Page 2 Tab Enter all of the required information on page 2. - if the HR Transaction is a Reclass, a Reclass tab will automatically appear in the list of tabs. Fill out all of the information on the Reclass tab. - if the HR Transaction is a TE, a TE Applicant tab will automatically appear in the list of tabs. Fill out all of the information on the TE tab. If the applicant already had/or has a position with the university, complete the TE Applicant History tab. 5 Complete the Goals Activities Tab Enter in the position description summary, goals, and activities for each goal. 6 Complete the Knowledge Skills Tab Enter in the knowledge and skills required (note - one set of position description summary, goals / activities, and knowledge / skills are needed for each title entered on Page 1 tab. 7 Complete the Org Chart Tab Create the organizations chart (not required for TE appointments). 8 Check for errors	 Click on the Tools drop-down in the window menu (top of screen) and select 'Error Check Entire HR Transaction'. Review and correct errors indicated. 9 Submit HR Transaction Click on the Actions drop-down in the window menu (top of screen) and click submit. This will send the HR Transaction to the next level for approval. 10 History Users can keep track of the HR Transaction status by clicking on the History tab.